I've written a lot about how I use Google Communities in the classroom to build community and engage students. 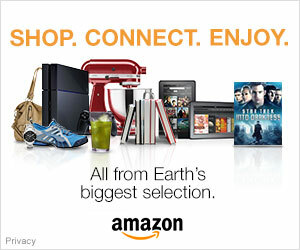 Find the relevant posts here. 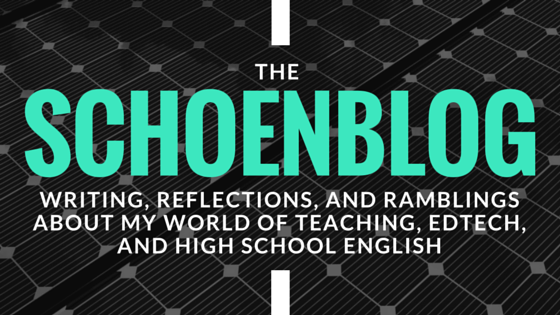 Now I want to shift the focus and write about how they can help you--the teacher. 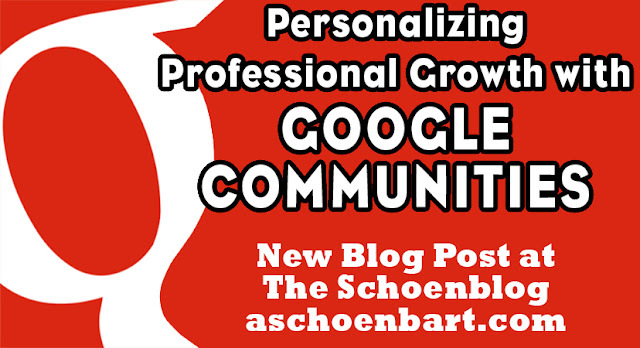 Google Communities have the power to be important tools in professional development and growth for all teachers. I participate in a lot of Communities--see the screen shot below--both private and public. Some are created for closed purposes, like PD in my school and others are wide open to anyone and everyone. Twitter is usually where I start when I have a question or need help. I send a Tweet with a relevant hashtag and hope that I have a follower who is knowledgeable, engaged, and interested enough to help out--and usually I find my answers. But because Communities offer focused and specific groups, filled with experts in our field, their power and potential shouldn't be left out of the conversation. In my district, Communities were one of the first GAFE tools we used, so even before I was on Twitter, I was searching for Communities. I found help in ones like Google Classroom and Google Apps for Education. I love going back to these Communities every once in a while and scrolling through for updates, ideas, and resources. These days, I'm much more likely to be participating--or lurking--in communities like Awesome Table or Apps Scripts for Education - Users and Builders. I've become obsessed with add-on smashing and combining so many of the great GAFE add-ons, scripts, and extensions to increase productivity and impact of edtech. But I can't code, barely understand java, and need help. These Communities are where I turn to. Not only can I read everyone's thoughts, posts, and resources, but I can ask them for help--and always get it. When I couldn't figure out Awesome Table, needed to find the old Form Mule, or wanted to learn Doctopus, the members and moderators here helped me quickly and happily. It's also cool to note that many of these moderators are creators of the scripts, too, so you really can turn to experts. I asked a question and Andrew Stillman responded himself. I got to talk to the experts, learn from them, and do better next time. I also love to keep an eye on local Communities, like Hudson Valley NY - Google Education Group and New Jersey Google Education Group. Wherever you are, I'm sure there's a GEG nearby. I love connecting around the world with technology, but sometimes it's nice to connect locally, too. I think there's also a lot of value in a closed Community, too. I've seen Communities for professional development classes, topics, departments, or even the whole faculty. Many use Google Classroom for this now, but I still find Communities to be much more effective for discussion and sharing. 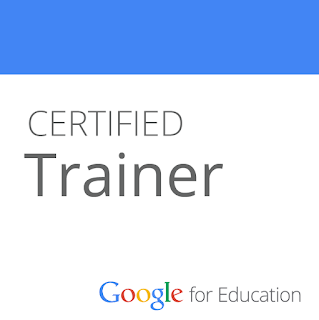 In my district, I taught a professional development class, Applying Google Tools in the Secondary Classroom. We shared everything we liked, learned, and practiced on the Community, and all participants still have access to it today. It also gave me a home to share a course evaluation, follow up with participants, and extend the learning. We also have a Technology Community in my school. The Instructional Technology Specialist shared resources, apps, and articles regularly. Instead of them getting lost in e-mail, the Community became a hub to check at our leisure, and an important resource in professional growth and development. Tip: Turn off Community notifications; otherwise, you will receive an e-mail for every post. I much prefer to check at my leisure. Simply click the "Notifications on" button on the top left of the Community, as shown in the screen shot below. I know most schools have Communities closed in the Apps Console for students. What about for teachers? How have you used Communities for professional development?